The San José Office of Cultural Affairs has been a lead partner in the Creating Connection initiative since it launched in 2014. Their leadership has taken many forms—supporting research efforts, facilitating peer learning programs, and offering grants to organizations in the City of San José to implement the research in their messaging and programming. But instead of viewing Creating Connection simply as a part of their grantmaking portfolio, Office of Cultural Affairs Director Kerry Adams Hapner and Arts Program Manager Karen Park took a broader view, asking what would it look like to embed the Creating Connection recommendations in all facets of their work as an arts agency? How could they apply the concepts to multiple areas of grantmaking as well as create new initiatives that help people connect with one another and celebrate creativity? We talked with Karen Park about their leadership on this program, what they’ve done to implement the recommendations in their grantmaking and communications, and how they’ve embraced their role as an agency dedicated to encouraging creative expression across their communities. What impact did Creating Connection have on the City of San José? "Our participation in Creating Connection has reinforced that we are on the right track in terms of the priorities that were identified through our cultural planning process in 2011. Two of the key priorities in our cultural plan are to support residents’ active, personal participation in arts and culture and to expand resident's access to arts and cultural learning opportunities. Creating Connection helped us by providing research-backed messaging that communicates the value of arts and culture to the broader community in ways that are most likely to resonate with them. In this way Creating Connection has helped us to be more effective advocates for arts, culture and creative expression in our city. We are also more mindful of images we select for our online media and how we talk about our work so that our message reminds people how creative expression has the power to build connections on multiple levels. When speaking in public, we try to use the term "creative expression" more than "arts and culture" so that it resonates with a broader group of people, as learned through the Creating Connection research. We also promote an existing grant program, take pART, that provides funding opportunities especially for projects where people actively participate in creative endeavors such as choirs, community symphonies, dance/music lessons and visual art-making. This grant program has been around for many years and is particularly relevant in light of the Creating Connection research findings. As a part of Creating Connection implementation, we provided two cycles of grants to arts and arts-allied organizations. These grants enabled organizations to test out new communication strategies and experiment with new or expanded programming that reinforced the Creating Connection messaging." Read more about these and other case studies. Creating Connection didn’t just impact your internal grantmaking and communications. What else have you done to encourage creativity in communities across San José? "We created an initiative called San José Creates and Connects that’s working to make creativity integral to residents’ everyday lives. We’re supporting place-based opportunities for creative expression and connection beyond San José’s downtown core -- helping residents to see the arts as a way to celebrate their neighborhoods, connect with their neighbors, and have their voices heard. Our work is also focused on celebrating the role of arts and cultural organizations, artists, and artist-run businesses in communities as cultural producers, teachers, neighborhood anchors, and community organizers. Part of our goal was to showcase everyday creativity in San José. 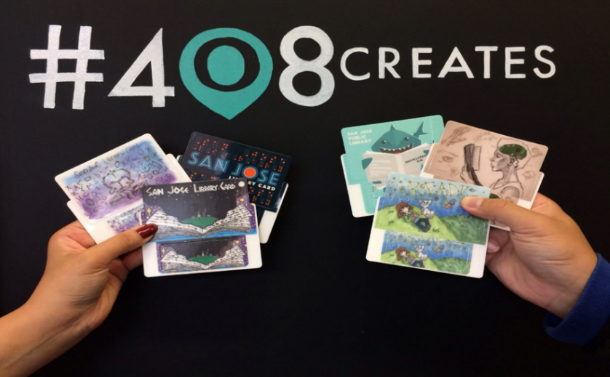 So we developed a hashtag, #408creates, with the tagline, "The Power of Creative Expression” (408 is the predominant area code in San José). We promoted the hashtag through our social media channels and encouraged the arts community and the general public to use it to highlight how each one of us is creative in our everyday lives. We created buttons and stickers to promote the hashtag at city-wide festivals and events, and we also commissioned mobile chalkboards with the hashtag that we take to events and encourage the public to write what creativity means to them." What happened as a result of this project ? Any community feedback? "We have over 4,000 Instagram posts since we started about two years ago and new posts are coming in on a regular basis from those who have received Creating Connection grants from our office as well from many individuals, so we know that people outside of the “core group” are beginning to adopt the hashtag. We've also developed partnerships with the City libraries and the Parks and Rec Department who also promote the hashtag when doing arts-related programming. Through anecdotal evidence, we believe these initiatives are getting the public to see how creative expression is already an integral part of their lives and to realize that their level of happiness, health, and well-being correlate with their opportunities for creative expression in their everyday lives." "It took a while to get momentum going with a new hashtag. It takes patience and constant promotion in social networks. The campaign needs to be organic in a way and can't be achieved with a top-down strategy. We had a lot of partners including individual artists, community members, other City departments, and nonprofit arts allies. We could always use more partners to get the word out." What’s been the impact of this project? "We consider the project a success. There is growing momentum with the [#408Creates] hashtag. We could not have come this far without the supportive promotion of our fellow arts organizations." What’s next for the Office of Cultural Affairs? "Once the hashtag began to gain momentum, we took it a step further and developed an idea to commission Creative License Ambassadors to engage members of the public in finding their own creative voice. Representing a diversity of discipline, career stage, and cultural backgrounds, the Creative License Ambassadors will recognize, celebrate, and promote diverse creative experiences citywide. We’re planning to launch the initiative later in 2018. · Distribute a keepsake "Creative License" which can be personalized and signed by receivers as a playful reminder that the cardholder has license to express themselves. We can’t wait to see what comes of the projects, and are looking forward to this opportunity to deepen community engagement with creativity and bring more opportunities for our community to recognize and celebrate their creative expression." Are you affiliated with a local arts agency or council? Curious about what Creating Connection recommendations might mean for your work and community? Visit our tools page to access resources that can help spark your thinking and contact us for more information on how you can bring this work to your area.